Guys, I honestly cried over this dish. It tastes SO much better than the "real" thing, its unreal! 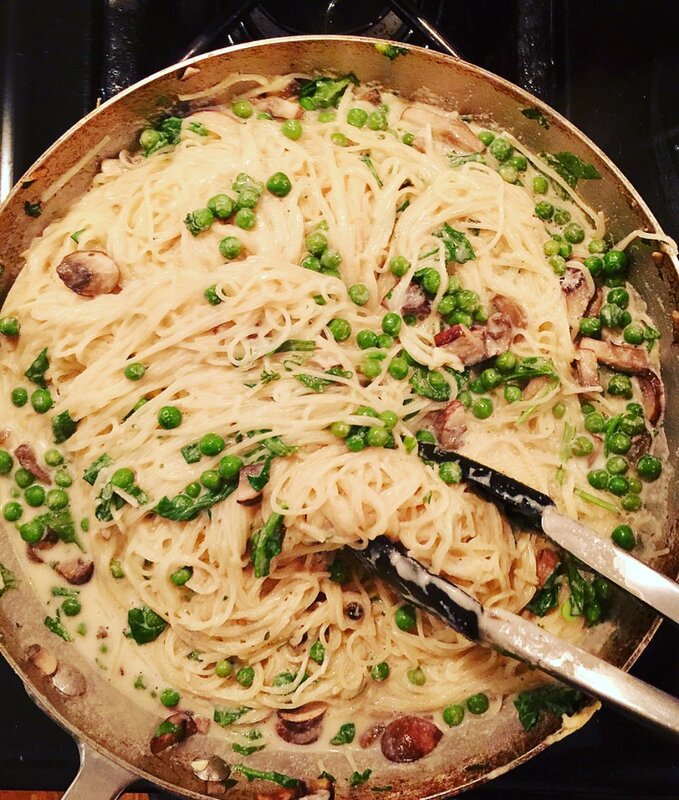 Capellini is my favorite pasta because it isn't too heavy & cooks super fast! But please feel free to use your pasta of choice. This dish can also be made gluten free! Let's do the dang thing. While your water is coming to a boil, in a medium/large skillet sauté 2 Tbsp olive oil, mushrooms & peas (onion/garlic if desired). Sauté until vegetables are slightly softened but still crisp. Deglaze the pan with the 1/2 cup of veggie broth. Just let this hang out & simmer on low. So, using a pasta ladle or small strainer with a handle, scoop out the pasta directly into the skillet with your veggies and broth. Using tongs stir the pasta allowing all the ingredients to mingle. Then add in your cashew alfredo sauce, about 1/4 cup at a time stirring after each addition. Add in the chopped arugula, stir. Next, this is where your pasta water comes into play. Start with ladling 2 scoops of the hot pasta water to your pasta. Stir with tongs to make sure all of the noodles are coated with the creamy alfredo. If you like your pasta a bit more saucy, add more pasta water! If you feel it’s too thin then add in more alfredo. And that’s how it’s done! Super creamy, yet light and guilt free capellini & veggie alfredo pasta! So good you will def want seconds!